In soft and adorable plush form. The mighty Godzilla comes to you in fantastic plush form! 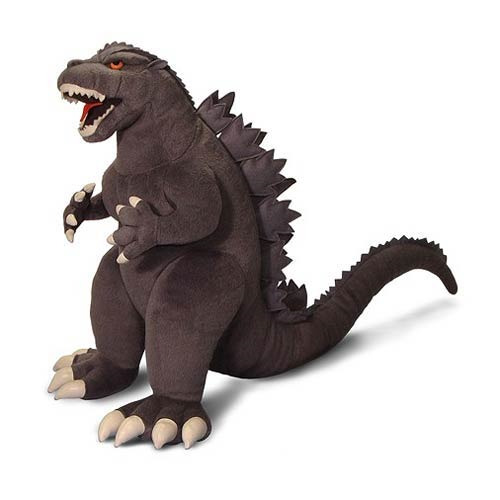 This Godzilla 15-Inch Plush features the King of Monsters with a fierce roar on his face. Measures 15-inches tall! Ages 14 and up. Standing 100 meters tall and weighing 60,000 metric tons, Godzilla is nothing less than the mightiest beast on the planet! Able to spit a stream of pure radiation, heal nearly any wound, and generate a shockwave of raw nuclear energy from his body, Godzilla's powers make him nearly unstoppable. However, the greatest weapon in the mighty creature's arsenal is his fighting spirit - when attached or confronted, Godzilla will not flee, he will not turn, and he will not be deterred until the opposing force is utterly obliterated!